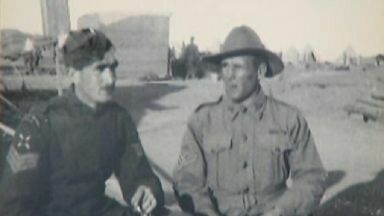 Jasper and Duncan Stewart Fraser, from Dundee and Brisbane, met while serving in Egypt. As the Great War waged on in France, soldiers from across the Commonwealth descended into the Middle East to fight the Ottoman Empire. Among them were two soldiers and half brothers; Jasper Stewart Fraser and Duncan Stewart Fraser. While Jasper lived in Dundee, his brother Duncan had moved to Australia. Remarkably, the pair was reunited whilst serving in Alexandria in Egypt. Jasper's daughter 93-year-old Silvie Taylor, thinks the meeting was by chance. "There couldn't have been any contact between him and my father and his half brother that was in the flying corps," she said. "So how they met up I don't know, I can't put two and two together. 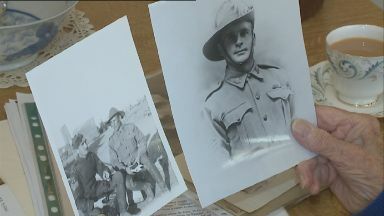 "But, they met up and I have a photograph of the two of them together, both sergeants, one with his flying corps uniform and the other with his Anzac hat on." Both men enlisted in the forces as soon as the war broke out in 1914, Jasper in Dundee and Duncan in Brisbane, Australia. Duncan was the older of the two and was from a family of four sons from his father's first marriage. He fought in the Boer War in 1899 with the Black Watch force, before leaving the service to immigrate to Australia where he later joined the Anzacs. After meeting Jasper in Egypt, Duncan was posted to France where he was killed by a sniper. Reading from a letter published in a Brisbane newspaper in 1916, Silvie recounts the event. "He had a high place in the battery and a true soldier," she read. "Never fearing except for the safety of others. "His death was sudden and instantaneous; it was the night of June 28 almost 10pm when he was proceeding across the open space heading to the major's dugout when he caught it. "They buried him just as the sun went down. "He is greatly missed by the whole battery but one can't always fight and always escape death." Silvie's father Jasper survived, but like many veterans from the Great War he didn't say much about his experience. "He joined the air crew as he didn't fancy going through the horrors of the trenches." she said. "My father was flying corps but that was also a dicey business, they had a very low life expectancy. "I said to him, 'so what did you do in the war?' and he replied 'I navigated and threw the bombs!' and that's all I know about his war experience." When the war ended, Jasper returned to his civilian role as a press photographer for newspaper publisher DC Thomson. As the centenary of Armistice Day approaches Silvie has a simple message. She said: "It's important in all sorts of contexts to remember. "We have to pass this on and our stories onto the current generation so they know what these men faced against all odds."